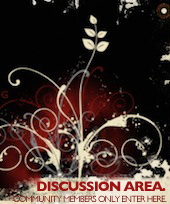 To enter the community discussion area portal as a visitor, click here. As you will see, discussion areas are not visible to the public. Besides, in all cases, browsing and posting are restricted to members only. Clicking the image to the right, which appears on all site pages, will also take you to the community foyer. Members may use that portal to gain entry. Our online discussion areas exist to give information, focus and support to a small, extremely private community of women who are sympathetic to or participating in one aspect or another of Watchfulness. The discussion areas on the now-archived mother site, the Submissive Wife Project, contained more than 150,000 entries written by women over a long period. In the short time this daughter site has been online, community members have contributed tens of thousands more articles, notes, comments and observations on everything from the most intimate aspects of submissive sexuality to information relating to fitness and nutrition, intellectual pursuits, explorations of the relationships between sexuality and spiritual health and the challenges of living in obedience. The value of this community is accretive: the watchfulness discussion areas are an invaluable archive of thoughts, experiences and insights. They are not intended for browsing by casual visitors. The community is administered by watchful sisters with long experience in our methods of formation. All community members are unpaid volunteers and our community is entirely self-supporting. Because we must pay hosting and other charges, we require all members to make a US$5 (£3) minimum monthly donation via PayPal for the ongoing maintenance and support of the community site. (If this is a hardship for reasons of financial distress or discretion, please contact the sister acting as administrator by writing to [email protected].) Funds will be used only for the support of our work. Full access is limited to active members only. Participation in the Watchfulness discussion area takes place in the context of formation and, in the case of monitored sisters, under the cloak of obedience.